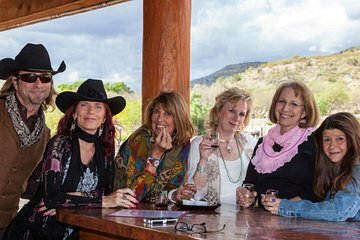 Pleasure your palate with some of northern Arizona’s most popular wines on this half-day winetasting tour in Old Town Cottonwood and Jerome, including transport. Make your way to three wineries, and enjoy three tastings at two of the stops. Get an hour and a half of free time to explore the old copper-mining town of historic Jerome on your own. Plus, numbers are limited to 14 people on this small-group tour, ensuring you'll spend an intimate day with a small group of like-minded wine lovers. Your winetasting tour in Old Town Cottonwood and Jerome starts with a pickup from your hotel in Sedona, Cottonwood, or Jerome. Be picked up in late morning, and meet your guide and the rest of your small group. Your first stop is at the first winery on the day’s agenda — Pillsbury Wine Company in Cottonwood. Here sample wines, and hear about the winery’s background story. Then, head over to one of Jerome’s newest tasting rooms, Passion Cellars. Your last wine tasting happens at Cellar 422. Take in great views of the area before heading over to enjoy some free time in the historic part of Jerome. Go off for an hour and a half on your own exploring all the former mining town has to offer. From the Jerome Historical Society Mine Museum to Douglas Mansion State Park, there’s more than enough to fill your time. Afterward, meet back up with your group and guide for the ride to your hotel.